Why not make a reservation to stay with us over April 20th, when this incredible show comes to The Cowichan Performing Arts Centre? Tickets to this event can be purchased through the CPAC Box Office. On April 26, there will be “A Night of Bowie,” for all you Bowie fans. Throughout the month, there are Easter Egg Hunts and Spring Markets and Garden Fairs. And of course there is always the Raptor Centre which opened for the year last month. Why not come and stay at Ormada House for a while. Lots to do in the Cowichan Valley in November. For instance, The Little Women Christmas Special starts at the Chemainus Theatre (a 15 minute drive from here) on November 16. “Louisa May Alcott’s beloved holiday story is a buoyant musical of romantic escapades, sibling rivalries and Christmas wishes. With their father off to fight the Civil War, the four March sisters have many imagined and real adventures. As they dream of their futures, encounter growing pains of youth and rise with courage to face their destiny, the March girls learn the true value of hope and family.” Sounds delightful! Why not contact us and make a reservation? 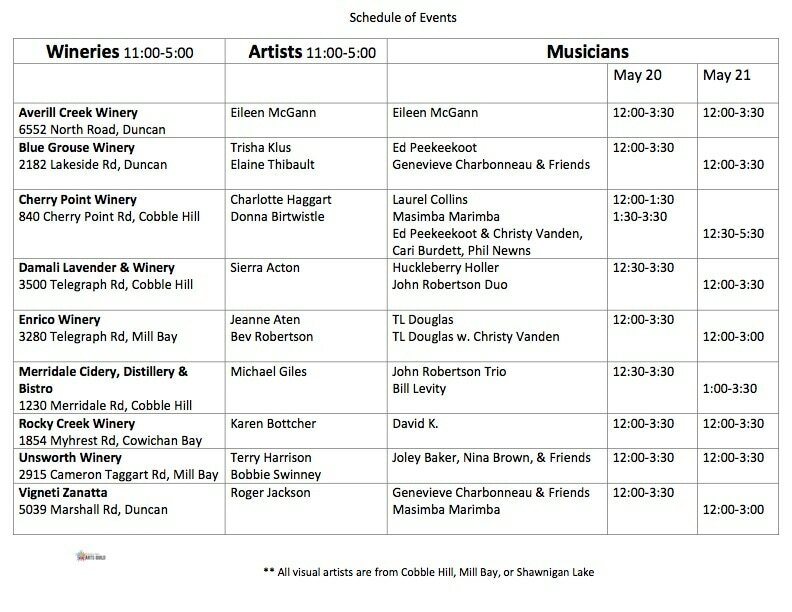 Lots happening in March here in the Cowichan Valley. Here are a couple of events you might like to attend while you stay with us! Sat. March 10th, 2018 Crofton. Come join us for a Latin Fiesta Night at The Osborne Bay Pub in Crofton. A fun fiesta with La Familia band ! Dance the night away to tropical music. Salsa, Cumbia, Merengue. If you dig Santana, Gypsy Kings, Buenavista Club and like to groove and dance to the latin heat. Come down and Fiesta til you need a Siesta ! Show Starts around 8:30pm. Tickets $13.00 per person or $25 per couple . Four talented young musicians met only once, but their red-hot jam session changed music forever. Elvis, Jerry Lee Lewis, Carl Perkins, and Johnny Cash created a score of rock ‘n’ roll hits that are still bringing the house down. Hear Blue Suede Shoes, Fever, Great Balls of Fire, Walk the Line, Whole Lotta Shakin’ Goin’ On, and lots more songs in this raucous tribute based on a true story! Mar.23-Apr.14, many show times to choose from. The Cowichan Musical Society brings the Tony Award winning, tap-dancing musical, ANYTHING GOES to the stage. Take a journey on an ocean liner voyage with some all time favourite songs – “I Get a Kick Out of You”, “You’re the Top”, “You’d be So Easy To Love” and the big tap number of “Anything Goes”. Enjoy a big, bold and Broadway quality show with music, dance, laughs and the age-old tale of Boy Meets Girl– no musical puts it on stage better than ANYTHING GOES! A hilarious shipboard romp, wrapped around one of Cole Porter’s most magical scores, ANYTHING GOES is Delightful, Delicious, and De-Lovely. Later in the month is Valentine’s Day, why not a romantic getaway with us at Ormada House? Lots to come here for in December! There is so much going on in December 2017, it is worth it to pay Duncan a visit and stay with us at Ormada House! Harp fans will enjoy the Winter Harp Concert at the Cowichan Performing Arts Centre on December 10, and the Nutcracker comes back on December 15th and 16th. Why not give us a call and make a reservation? Wineries and Cideries, Cowichan has it all! With over 20 wineries in the valley, one cidery and three distilleries, Cowichan has it all. Give us a call and stay with us as you explore these taste sensations. Merridale Cidery and Distillery also has tasting and dining facilities. Sep. 29–Oct. 8, the doors are open for daily tours and tastings. Enjoy an incredible meal in our gastropub, stroll through our orchards, check out the farmhouse and distillery, sip at our tasting bar or lounge, and visit our farmhouse store stocked with locally sourced, seasonal. All month long, there is the Salt Spring Sip and Savour Food Festival. The Festival brings together farmers, growers, food providers and chefs from Salt Spring Island and Vancouver Island, with vintners, brewers, cideries and beverage providers from neighbouring communities. You are ten minutes from the ferry here at Ormada House! Harvest Fair, Salmon and Mushrooms and Flamenco! Duncan United Church hosts its annual Harvest Fair on Saturday, the 23rd. Loads of booths, huge garage sale, plants, books, baking, collectibles, silent auction with some great items. On the 23rd and 24th is the Cowichan Lake Salmon and Mushroom Festival. Last year over seven hundred adults and children attended! Enjoy the various vendors selling jewelry, preserves, fresh produce, home baked goods and lots of mushroom growing kits. As well, local artists have joined the celebration, and many of the area’s painters, ceramists and artisans are offering their vision of the beautiful nature that the valley offers. And on September 30th, The Cowichan Performing Arts Centre is hosting Flamenco Rosario, a spirited event celebrating the traditional, intimate setting of flamenco performance. Originating in the era of the café cantantes, and continuing today in Spain’s tablaos flamencos, the form showcases dancers, musicians and singers sharing the stage. Why not stay with us for any or all of these events? Give us a call at 250-746-9683! So Much Happening here in July! With The Beatles and British Invasion came two decades of rock-n-roll, transforming the music scene forever. Experience this most influential music in a live tribute to the Beach Boys, The Everly Brothers, The Monkees, Elton John, Simon & Garfunkel, Sonny & Cher, and many more incredible artists! Why not stay with us for this wonderful event on Father’s Day Weekend coming up? Give us a call! Celebrating the awakening of Summer Solstice Wonderful and Unique Gifts for Yourself and Others. Talented artisans & wellbeing practioners representing the Cowichan Valley, and up & down Vancouver Island. Find us at Cobble Hill Hall and surrounding grounds. 3550 Watson Ave. Saturday, June 17 from 10-3pm We have hand makers, artisans, candle makers, designers, health based practitioners, live music with Beverly McKeen and Canadian Suite, mini seminars/workshops, demos and so much more It’s a free event and everyone is welcome. We are still accepting enquiries for select categories. Why not come and stay with us while you enjoy the festival? Click on the image below to go to their web site for more information.